This giveaway is now closed. Please stay tuned for the announcement of the winner! This is a joint giveaway cross-posted on very, very fine and Natural Parents Network. You may enter at one site only. Please find the section marked “Win it!” for the mandatory main entry and optional bonus entries. Despite owning more baby carriers, slings and wraps than one person could ever wear out in one lifetime, I was thrilled to get the opportunity to try one that I’d overlooked when my son was still tiny: the Baby K’tan. Assuming that, because it was made from soft jersey fabric, it was only suitable for very young infants, I thought my near 30 pound, 17 month-old and I had missed the boat. 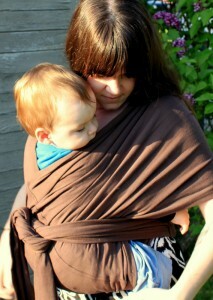 Similar stretchy wraps had been overwhelming to me as a new mama, though I knew others who used and loved them. One family, in particular, raved about their K’tan as though it were a tremendously helpful member of the family. When I read that the Baby K’tan could accommodate a toddler up to 35 pounds, I was excited to put it to the test, and if it proved as magical as my friends had said, I was hopeful that it might see me through another kid or two. In the box: The Baby K’tan is a carrier made of two connected loops of fabric. It comes with a sash, necessary for certain carrying positions, and a matching hat for your babe. While I’m not one for logos on my kid’s clothes, the cute factor is undeniable and I would definitely make an exception for the sake of a complete ensemble of this super soft, rich brown cotton. The sash doubles as a storage bag — a handy detail I really appreciated. You also get a user’s manual with photo-illustrated instructions for several different carries, including two suitable for twins! Using the Baby K’tan: I’ll admit: I didn’t have high hopes for the comfort of this carrier. We’ve been a back-carrying duo for quite awhile and the idea of my excited, curious (flailing, reaching) toddler on my front — or even strapped onto my hip — was daunting. When I loaded him into the hug position though, he cuddled right up and, to my complete shock, felt light. The way the Baby K’tan distributes weight is nothing short of amazing; I imagine that carrying an infant in the K’tan must be like wearing a slightly heavier T-shirt. The hip position and two hip position, both shown in the instruction manual, were equally comfortable for me, though less restrictive and so, less calming for my little guy, but I could easily see him hitching a ride in the K’tan around the farmers’ market when he gets tired of walking. A few months ago, when snuggles were higher on his priority list, he’d have stayed put in the K’tan all day. One reason stretchy wraps have never really appealed to me is bulk. In the winter, an extra layer is helpful but I worried about feeling mummified in warm weather. In the K’tan, I can honestly say that my shirt did not feel irrelevant and, thanks to the careful sizing, I wasn’t swimming in extra fabric. For parents of different sizes who need or like to share carriers this would be a drawback, but the lack of bunching, extra wrapping and tucking was a definite plus for me. As someone who has never before used a stretchy wrap, the positions were not really intuitive for me and required a few readings of the directions and rehearsals sans kid. I recommend being sure you understand the positioning and order of operations before enlisting the cooperation of your squirming baby. That said, with practice, I think it would become second nature just as using any carrier does, especially given the comfort level once everyone is in place. Luckily, the Baby K’tan website features supplemental videos for each type of carry — a helpful resource for the more visual learners and occasionally forgetful but smartphone-toting among us. With a younger baby, this would be my go-to carrier of choice and I look forward to using it for another six pounds with this child! To purchase your own Baby K’tan visit their website. Basic carriers start at $62.99. In addition to baby carriers, they also sell jewelry, clothing and other handy accessories to make aspects of your life a little easier. For your chance to win a Baby K’tan carrier, enter in the comments below! This contest is only open to the U.S.
MAIN ENTRY: Tell us why you would like to try this type of carrier. This is a joint giveaway with very, very fine and Natural Parents Network. You may enter at one site only, and we’ll be recording IP addresses to ensure that there are no duplicate entries. That said, please do visit and enjoy both sites! Tell us another product on the Baby K’tan website that you would like to have. Subscribe to the very, very fine RSS feed. Leave a relevant comment on a non-giveaway article at very, very fine and tell us which post (comment on separate posts for up to 3 entries total). Follow @BabyKtan on Twitter and leave your Twitter name in the comment. Enter another of the current giveaways on Natural Parents Network (1 extra entry per giveaway — check back for more!). Like Baby K’tan on Facebook. Post this giveaway on your Facebook page or wall and leave the link (1 entry). 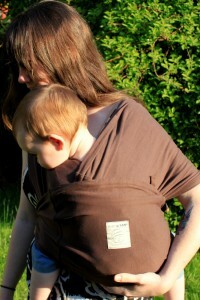 You can use this status update: Win a @Baby K’tan carrier from @Natural Parents Network for babywearing. Contest ends July 24 and is open to the US. 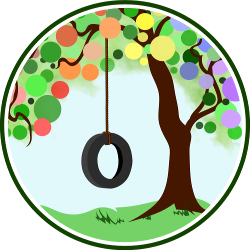 Put the Natural Parents Network badge on your website or add http://NaturalParentsNetwork.com to your text blogroll for 2 extra entries each. The HTML code for the badge is in the right sidebar. Leave your site URL in the comment. Contest is open ONLY TO US. Contestants may enter at either very, very fine or Natural Parents Network but not both. Entries will be combined for the drawing of a single winner. Contest closes July 24 at 11:59 p.m. PST. Disclosure: Our reviewer purchased the Baby K’tan for review. Our reviewer, Stefanie, lives in the occasionally beautiful Pacific Northwest with her partner, their son, some chickens, some cats and a bunch of books and records. She blogs at very, very fine. I already purchased a ring sling and an ergo to try with the new baby that’s coming in a few weeks, but I’ve heard so much about stretchy wrap, so I’d love to try it. I could totally use some teething bling too… maybe I’ll have to add it to my registry! I like NPN on FB. I’ve been wanting to try a K’tan for some time now! I LOVE wraps, but sometimes I just want something simpler without all the length and tying and such! I’m a Google Reader subscriber! Loved the moby, but the bulk is a bit annoying—have heard only good things about this. I have a neighbor that has one and I think it is wonderful! I a new to natural parenting and haven’t gotten to try baby wearing though I’ve heard plenty about it. My baby is only 7lbs so it seems like this would be a good time to start and still get a lot of use of it. I would love the pink cupcake teething bling gift set, the loopers lace system would be awesome for my 4 year old, and the binki bear would be great for baby as well. Looks like an ingenious idea!